Toby, Pippa, Dash and Megan are all having a swimming race. Can you find out which order they finished by following the wiggly lines? Why not Download the Find the Winning Swimmer Puzzle and see if you can find out who's the winner. 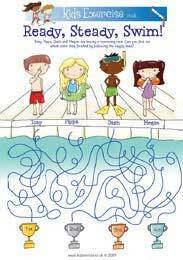 This activity is aimed at 3 to 8 year olds, it's a fun way to raise your child's interest in exercise, as well as building their problem solving skills.